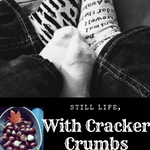 family | Still Life, With Cracker Crumbs..
On the weekend, we usually head for the wild. Or as wild as we can get near Detroit. Lol. The woods call our name and we go. This past weekend however we took a detour and it was a lovely one. Saturday was a gorgeous sunny day, spring was in the air and all was merry and cheerful. Detroit’s Pewabic Pottery was having a Celtic Celebration, and I couldn’t wait to go. I love the work that comes out of Pewabic, and my family ancestry is very Irish. They had advertised dancing, things for the kids to do, and best of all, live music. I grew up spinning around the living room in my mom’s arms to the songs of the Irish Rovers and I play them now for my son. So I was super excited for him to hear some Irish music live. I knew he would really love it, that and the dancing, all that lively jumping up and down. We got there at the start of the event since Pewabic is not a large building really, and full of breakables and we had the boyo with us. I wanted to ensure that we were not swallowed by a crowd, plus I didn’t want to chance breaking anything by accident. It was nice as we were among the first to arrive, and we were able to listen to the music and do some coloring without much crowding. Although, Wyatt was more interested in his pretzel than coloring, so Billy colored instead. Lol. Wyatt did love the music as predicted, and loved The Rattling Bog the very best, just like I do. Oh that fireplace! If only…maybe one day? So many beautiful items were on display, so much fantastic artistry. I ended up buying the bunny pictured alone, although I am going back for more very soon. I love rabbits. The tile I bought was by a Canadian artist named Mary Philpott, and is in the style of the British Arts and Crafts movement. I am in love with it! You can check out more of her work here. Sunday was about Billy. Kind of. He wanted to go to an RV and Camper show, which I wasn’t super excited to do. But you know how you do, you do things your spouse wants and vice versa, right? Plus, he threw in that it was in the same city as a coffeehouse that I have wanted to go to for twenty whole years! So, off we went. I didn’t hate the RV thing – but I did think once you saw a few of them, why look at them all? We are considering getting one so we can start doing longer trips with the kiddo on vacation. As a kid with cerebral palsy, he has a lot of equipment that goes with us on trips, and a small RV might just be the ticket. Plus…I have turned into a weird germophobe along the way. I love staying in hotels but I am always a bit skeptical about their cleanliness, which I am sure is warranted in some cases, but not all! I guess I just need to bring my own bed with me places now. LOL. So this coffeehouse – Billy went to it twenty years ago when he was doing travel computer training, when we were first married. Only an hour away, and we never made it back there – until last weekend! This magic place is called The Raven Cafe, in Port Huron, and is so very Edgar Allen Poe. I loved it! It was worth the wait. The coffee was hot and black and delicious, and our food was pretty darn good too! Wyatt wasn’t as impressed, and began to finger paint on the mirror next to us with his cheese sauce. (we of course cleaned it up and stopped him! we are not those parents..lol) If you ever are in the area and get the chance to stop in, I recommend it. The service was friendly, the coffee perfect, and the tables named for poets! It was the perfect day for it as well, cloudy, rainy, a bit gloomy, and the cafe was all warm woods the color of honey and just warmth and coziness. The website describes itself as “Part Hogwarts and part Cheers, the Raven is a unique place. When you step through the doors, you’ll get the distinct feeling you’re walking into a story.” And this is a very apt description, and I agree. I can’t wait to go back again. So our weekend had a bit of glee with a side of gloom, and I loved them both! This weekend was my son’s fourth birthday! Time flies – I never knew how fast until I became a mom. One minute he’s my little peanut baby boy and the next he is a big time four year old! We love to be outside, especially in the winter, so this weekend we kicked off celebrations with a special outing just for the three of us to the Howell Nature Center. The Howell Nature Center is a rehab facility for wild animals that get sick or injured, with most of the animals being returned to the wild. However, not all of their animals are able to return due to the severity of their injuries, and reside at the Nature Center. It was a cold and snowy morning, so we had the place to ourselves, which was nice honestly. Quiet, peaceful…until the Sandhill Cranes figured out it was their feeding time. Wow they are so loud! It was pretty cool to hear them though, and we watched them get fed. When we approached the enclosure the pair were excited, asking their caretakers for their frozen mice. And on the ground was an egg! The female had laid an egg, unfertilized, but an egg. It was really huge and pretty, and brand new. The woman working said it would be used for educational purposes. It was neat to see! After watching the cranes, we wandered around, visiting the other enclosures. Some animals were being housed indoors for the winter, but many were still in their homes and feeling like visiting us, such as the bobcat, who strolled on by like a giant indifferent cat; the beautiful foxes – my favorite – Vixen and Copper, who were rescued from a breeder in Ohio that was going to use them for fur; the mink, who was flipping and flopping and playing all over his enclosure; and many mammals, like the deer, the coyote, and the porcupine. And we saw almost all of the birds – including two beautiful snowy owls! Yeti is a snowy that is their most recent intake. He was found in a back yard, starving, having been hit by a car as well, with a broken wing, no longer able to fly. We saw so many owls and hawks and eagles – I also fell in love with a handsome guy named Leo, who is a long eared owl. He was so cool! On Sunday, we celebrated with a party for the boyo! We go to our local metropark all the time, and Wyatt loves it there. So it made sense to have it at the nature center! We did an owl theme, since my kiddo loves owls (and does a pretty good imitation of an Eastern Screech!) and there was so much for the kids to play and do. The interpreters read the book Owl Babies to the kids, then had them all make the cutest little owl babies out of pinecones and cotton! It was such a simple little craft, and the kids really enjoyed it! Although getting them all to stay in one place was a little like herding cats. They would wander around, come back, make another – typical preschooler behavior. They all did such a nice job though, and the interpreters did a great job with the kids. It was the perfect activity. We kept the food simple, just pizza and some trail mix, pretzels and Teddy Grahams – and of course cake and ice cream. I went a little crazy ordering the cake, but it was beautiful and delicious. Then we just opened gifts, and let the kids explore and play for a while. It was a really nice day – and it even snowed for us, causing the woods to look gorgeous and all the birds to flock to the feeders. We saw so many different birds, but the most brilliant were the cardinals, with their red feathers so bright against the snow. At the end of the afternoon, we said goodbye, and handed out the goodie bags that my stepdad made that looked like cute little owls! Inside we had a small decorative birdhouse for all the kids. We were all exhausted of course afterwards, but it was more than worth it. My boy had a wonderful, fun day with all his friends, just the way it should be on your birthday. I think most of us will admit that watching a good holiday movie is one of the little indulgences in a season that can be chaotic as well, with all the running and shopping and wrapping and all the bits and bobs that we do in December. But curling up with a favorite feel-good movie with loved ones is an easy way to just let it all go for a while, and get sucked into some magical world where all ends well and brings a smile to your face. When we kick back with our hot chocolate or wine, depending on the day and mood, these are some of the movies we must watch every December. Some are traditions that began when we were just little, some have been added in over the years. Maybe some of them are on your list too! National Lampoon’s Christmas Vacation: Our whole family can pretty much recite this movie word for word. It’s a comedic look at the holiday but also has its poignant moments too. I remember watching this with my dad one year when I was in high school, and he was laughing so hard at the “Squirrel!” scene he was silent laughing with tears rolling down his face, rolling on the floor. Like really ROFL! Emmet Otter’s Jug-Band Christmas: I adore this movie. We just watched it with Wyatt the other night for the first time, and he did too. I was so happy that he liked it! The Muppet Christmas Carol: Another family favorite. I am a huge Muppet fan, have been since I was a little girl, and I love this version of a Christmas Carol. And Michael Caine is as always amazing. I am looking forward to watching this one with Wyatt too this year. White Christmas: Oh, how I love this movie. I used to watch it every year with my mom and brother, and now Billy and I and Wyatt watch it. Wyatt actually loves musicals, he is a musical kid. And Bing’s voice – Christmas isn’t Christmas until you hear a carol crooned by him. A Charlie Brown Christmas: An oldie but goodie. A Claymation Christmas and A Garfield Christmas: I’m putting these on here together because we watch them together on the same night, back to back. Much to my husband’s chagrin, Wyatt also likes these movies. Lol. Billy is not a fan, especially of Claymation Christmas. It’s just such a part of my youth, watching these while drinking wassail with my brother and stepsisters, that I keep the tradition alive. And now Wyatt enjoys them, so a whole new tradition has begun! So, there you have it! Our must watch Christmas movies. That doesn’t mean we don’t watch other ones – I watched Chrismas Prince on Netflix last year at least every other day for a while. And now, I am gearing up to watch the Wedding! (The Royal Wedding! Lol) I randomly watched The Christmas Bunny last year and loved it, although my heart broke a little bit a few times. And Carol Brady is in it! Well, not as Carol Brady, but as a curmudgeonly rabbit rescuer! I loved it and of course wanted a rabbit after watching. We didn’t get one, but I still wanted one. And one year I watched a movie called The March Sisters and loved that one too – and I have been looking for it to watch it again ever since. What about you? Any movies you must watch?